[2G Unlimited Pack]Buy Airtel Cheap Data - 2GB For N200 And 5GB For N200 - BaseOnTechs - Learn To Do It Yourself. 2G Unlimited Pack is a new plan launched by Airtel NG making it possible for students and everyone to buy. And right now in this post, I will be telling you how you can possibly get this cheap data plan and you can start browsing without having to fear about exhausting your data. But before we proceed, there are some things you need to know about this plan so you don't have to be misled. This cheap data plan was officially launched by Airtel NG. So you won't have to worry if it's going to be blocked that soon. For me, I believe it will last forever(lol😂. Just kidding though, nothing actually lasts forever). Who knows when it will be seized but before then let's keep surfing. Before you go ahead and subscribe for Airtel 2G Unlimited Pack, you should make sure you have no existing Data Bundle Plan on your current sim. Why am I saying this? If you have an active data bundle plan, it will be deactivated automatically. Even though you bought a costly plan. So Take Note of this. It's very important. This Airtel cheap data, in particular, works only on a 2G network but you don't need to worry because we have got a way to boost its browsing speed here to help you enjoy your browsing experience as if your browsing on 3G Network Service. 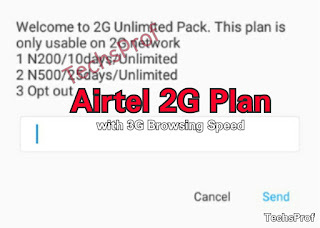 Check Out ➡ How To Boost / Increase Airtel 2G Plan Browsing Speed. Airtel 2G Unlimited Pack has a really good period of expiry. At least I used it up to 116MB using the above trick to increase it's browsing speed. I believe you now know some important things about this plan. So without wasting much time let's proceed. Below guide is how to activate the AIRTEL 2G PLAN in a few minutes. In other to get your 2gb, it is highly recommended that you get an AIRTEL sim first. Yeah if you don't have any, you need to get one. After dialing you are to select the plan you which to buy. So just go ahead and type 1 and send for 2gb(N200). Dial *482# and then type in 2 and send. You have successfully activated the AIRTEL 2G Plan, you can now start surfing. Dial *482# then type in 3 and send. Kindly share with friends on social media with the share buttons below... Also, don't forget to leave a comment.